The Stressless® Mayfair Recliner and Ottoman combine style and comfort for a smaller personalized fit that easily adjusts to provide maximum comfort with the Glide system following your body’s slightest movements. 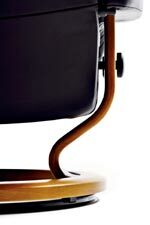 Featuring a two-stem base made from European Beech available in a variety of finishes, while providing maximum mobility with a swivel action that lets your easily turn 360 degrees, along with pillow arms providing perfect support. The Mayfair Small Stressless Chair & Ottoman by Stressless at HomeWorld Furniture in the Hawaii, Oahu, Hilo, Kona, Maui area. Product availability may vary. Contact us for the most current availability on this product. Fabric Options Four types of leather are available, each in a full range of colors. 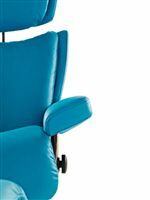 The leather is vibrant and beautiful upholstery material. The play of color in leather and its natural markings make each piece of furniture unique. Arm The pillow arm adds comfort and style. 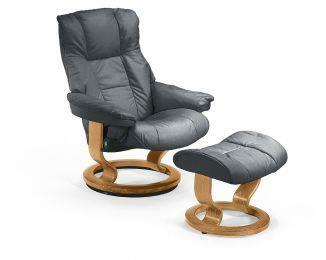 Recliner Mechanism Plus system provides continuous support for your head and lower back. Double-sided mechanism ensures maximum stability and functionality. Frame Construction Two-stem base adds superior stability. For maximum mobility, swivel action lets your easily turn 360 degrees. Padding & Ergonomics Space-age foam is molded directly over the frame, to cushion your body. An additional pad of soft space-age foam ensures optimum comfort. Super-soft polyester fiber cushions your body and ensures an attractive look. Seat Support Durable steel frame and flexo springs for superior resilience and continuous support. Warranty 10 year warranty from the date of purchase of the product, which covers the Plus™-system and the internal metal frame, including the metal springs and gliding system. It does not cover damage to leather or woodwork or any faults or damage caused by the use of the product other than in accordance with the manufacturer's recommendations. Each Stressless recliner comes in two or three sizes so that you can select a personalized fit for the maximum level of comfort. The swivel base allows you to swivel a full 360 degrees at the mere push of a foot. Also, both recliner and freestanding ottoman are equipped with a Glide System that follows the body’s movement to provide perfect comfort and support. When it comes to comfort, fit matters. Your body will appreciate the difference. Select from four types of leather, each in a full range of colors to suit your personal style. The leather is vibrant and beautiful upholstery material, while the play of color in leather and its natural markings make each piece of furniture unique. The free-standing ottoman is an integral part of the Stressless comfort concept of movement and relaxation. It is designed to provide comfort for everyone, regardless of size. When your body reclines, your legs move forward; Stressless ottomans have a built-in glide function that moves with your legs for extra comfort. The innovation of the Stressless Plus System automatically provides correct support for your head and lumbar area in all reclining positions. The lower back support adjusts in parallel with the headrest, so you can enjoy perfect support, whether you are sitting in an upright or reclining position. The headrest adjusts automatically, so you can read and watch TV even in a reclined position. 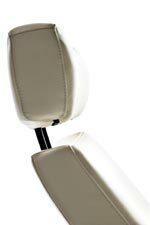 You can also adjust the headrest with a simple hand movement to lie flat and relax. The collection is a great option if you are looking for Casual furniture in the Hawaii, Oahu, Hilo, Kona, Maui area. 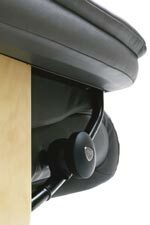 Simply adjust the Stressless® Glide wheels to the setting of your desire. Recliners and sofas offer four types of leather and fabric to choose from in a full range of colors. Browse other items in the collection from HomeWorld Furniture in the Hawaii, Oahu, Hilo, Kona, Maui area.